Meet our amazing Pre-Kindergarten Faculty and Staff who use a Creative Curriculum to teach these young minds! 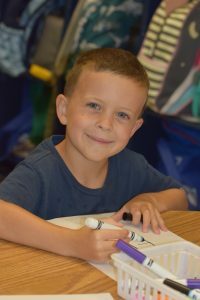 The main objective of Pre-Kindergarten at Saint Peter the Apostle School is to help your child develop spiritually, socially, emotionally and cognitively. SPA provides a rich environment with daily opportunities for your child to learn through exploration and guided interaction with materials selected with an educational objective in mind. We offer age appropriate activities which inspire curiosity, reasoning skills and help children develop a love for learning. Children feel secure through a predictable routine, but materials change frequently to keep the classroom exciting and active. Each day students participate in large group, small group, and individual activities that engage them in active learning. Away from home, perhaps for the first time, they are encouraged to make choices and to become independent. Learning to cooperate and respect others, respect materials, following classroom procedures, working with intentionality, develop curiosity, accepting responsibility for one’s actions, recognizing authority, verbalizing one’s needs, and waiting an appropriate amount of time are just a few of the many social and emotional skills that are focused on every day.